Groom Your Beard Like a Pro With The #1 Original Men Beard Wipes For Manly Men Bundle Pack Includes: (1) 10 Pack Box of Zekes Beard Wipes + (1) 30 Pack Box of Zekes Beard Wipes Let me ask you a few short questions: Do you want to have a well-groomed and properly cleaned beard that makes you look awesome? Would you like to have a beard that gives off an impression of masculinity that women love? Are you tired of your dirty, flaky and itchy beard that smells weird? If your answer to any of the questions above is yes, then Zeke's Beard Wipes are a must buy for you! Will You Miss The Chance To Keep Your Beard Well-Groomed Effortlessly? Keeping a beard clean is just like taking care of your hair or nails. Do you leave your hair dirty without using shampoo and/or conditioner? Of course not. The same needs to be done for your beard, if you don't want it to turn into a forest of dandruff. Beard grooming has never been so easy before Zeke's Beard Wipes! When you use these beard wipes, you know that you will never have a stinky, dirty or itchy beard. Instead, you will have an incredibly clean, masculine-looking beard! Why This Beard Wipes Are The Best Ones You Could Ever Use: They contain 3 essential beard grooming oils that take care of your beard in the best possible way: Coconut Oil, Jojoba Oil & Argan Oil. They are alcohol free, incredibly soft and gentle for your skin - they don't irritate it or cause dryness. They take care of your beard in just a few seconds while giving the best possible result - simplicity at its finest! What are you waiting for? Don't Miss This Chance - Scroll Up & Click Add To Cart Now! FAST & EASY: When you use Zekes Beard Wipes, all you have to do is to tear open, extract, bathe and you are done and looking good! In less than a minute you have transformed your beard from a hideous soup-catcher to an irresistible accessory of masculinity! BEARD"S ELIXIR: If you want your beard to look beautiful, clean and masculine, then you should look no further than Zekes Beard Wipes. Give your beard a fast bath and go out like a man! Zekes Beard Wipes are the only thing your facial hair need! SUPREME CONVENIENCE: Use Zekes Beard Wipes as part of your normal beard care routine like you would do with beard oils, beard balms and conditioners. Or simply take them with you and clean your beard on the go with ease! FLAWLESS RESULT: If you have a beard, Mustache, or thinking of growing one, then the most significant thing is to maintain it clean and polished. When you use Zekes Beard Wipes you know that you will never have a dirty, mangy and flaky beard! ENJOY YOUR LIFE: Being afraid to put some extra mustard on your burger just because you know it will be smeared all over your facial hair is simply annoying. 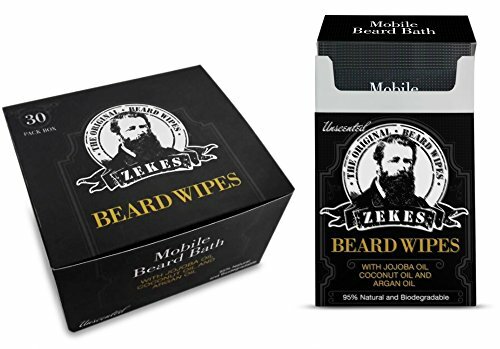 With Zekes Beard Wipes, you can eat like a man and never worry about your beard getting dirty - you can clean effortlessly it in just a matter of seconds! If you have any questions about this product by Zekes Beard Wipes, contact us by completing and submitting the form below. If you are looking for a specif part number, please include it with your message.